18A. DOUBLE PLAY is a [Baseball feat]. (More baseball in an NYT crossword theme! Snzzzzzz.) Double time is quick, playtime is fun. 24A. [Physics period] is HALF-LIFE. Halftime is for football and basketball (not baseball!). Talking Heads had that song, "Once in a Lifetime," that I'm listening to right now. 48A. You don't exactly put on a [Brave front] when you put on your GAME FACE. You put on your...game face. Determined. Brooking no nonsense. Ready to win. It's not about bravery. Game time is, uh, when the game happens. Face time is what telecommuters don't put in much of at the office. 52A. [Asthmatic's concern] is AIR QUALITY. Airtime is when a program is aired or when a cell phone's in use. Quality time is engaged in a battle royal against quantity time. You know what "time" didn't make it into this theme? "Hammer time!" I can't think of a word that partners with hammer that can also precede time. 1A. [___ salad (dish with ground beef)] clues TACO. I get mine with chicken. 14A. ["Get ___," 1967 hit for the Esquires] clues ON UP. Aw, no "Movin' On Up"? 3D. [Basilica feature] is CUPOLA. 4D. An OPEN FLAME poses a [Hazard around an aerosol can]. 6D. [Many Mel Brooks films] clues SPOOFS. Not FARCES, no. 26D. THORIUM is a [Metal that's an effective radiation shield]. 33D. TIBERIUS isn't just Captain Kirk's middle name; it's also [Caligula's predecessor as emperor]. 45D. [Russian playwright Andreyev]'s first name is LEONID. Favorite clues: 32A: To [Not just turn down] the volume is to MUTE it. 41A: [Palm product] is palm OIL, not a Palm Pre smartphone. The 13A: [Leading lady] in a field is a DOYENNE. 47D: [-like] clues ESQUE, as in Zolaesque. The rhyming words NATTER and RATTER stick out. One's a [Vermin hunter] and the other's a verb meaning [Flap one's gums] like a nabob of negativism. And before I go, let me refer you to the video of the Cyndi Lauper song "Time After Time". I've always liked that one. Donna's theme is COVERT OPS, or [Hush-hush activities]. Never noticed before that it looks like "cover tops" if you slide the word space over. The other four theme entries contain a covert OPS spanning two words in a multi-word phrase. To STOP SHORT is to [Jam on the brakes]; in tennis, a DROP SHOT is a [Soft court stroke]; [Small family businesses] are MOM-AND-POP STORES; and CHOP SUEY is a [Stir-fried dish]. There's a singular covert OP that's not part of the theme in COP A PLEA; surely it's our undercover double agent who's been nailed and is now copping a plea. Not sure why AMOCO/[Big name in gas] isn't clued with a "one-time." Are there still Amoco stations? They've all been converted to BPs around here. The top half of the grid's got some great fill—JAY-Z meets JIHADS beside SQUIRT crossing PAISLEY. Lower down, though, I'm less happy. PPPS is a post-post-postscript, or [Third afterthought, in a ltr.]. There's a blast from the distant past with the Southeastern pile-up or SEATO, the [1954-1977 defense gp. ]; ERGOT, the [Grain disease]; EPODES, or [Lyric poems]; and Britishly spelled OCHRE, or [Yellowish earth tone]. Add in the partial ERR ON and plural DOUGS, and you've got yourself a "meh" corner. I'm not a [Huge fan] of the word ADORER, but if that's the definition, then I'm definitely an adorer of this puzzle. Could I compose a PAEAN [Joyous song] to it, I would. My words will have to suffice. Let's ASSAY [Examine] this creation to see what gives it its decided EDGE [Advantage]. The title tells the tale. There are seven lively theme-answers, and the E-Z pairing makes an appearance in each one. In fact, in six of the seven we get EE-Z; in the seventh (at center), we're treated to EE-ZZ. So there are a lotta Zs today. Then, and most impressively, these seven theme-answers fill 67 squares. More than that, they all interlock and/or overlap at least one other theme-answer. Holy moly. That's a serious feat of construction and does tend to AMAZE me. And the non-theme fill does not suffer as a result, but holds its own very nicely. 39A. CONDOLEEZZA RICE [Hillary Clinton followed her]. Sharing the letter "N,"
63A. SEA BREEZE [Boardwalk attraction]. Aaah. Lovely. DOZED/[Took a nap], where we get Z-E. How do you like that?! 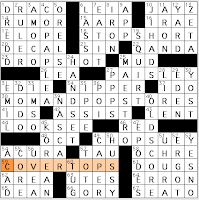 Right at 1-Across, there's a SPIDER, an [Animal that has something in common with this week's puzzle]. Boy, my husband was watching a show on the Discovery channel last night about arthropod combat. Lots of large, venomous spiders, plus insects and scorpions. (Luckily, nothing in the centipede department, because those critters freak me out.) Word to the wise: If you are a bug, steer clear of the praying mantis because it will mess you up. 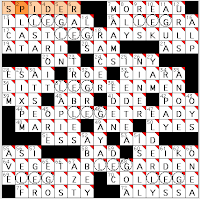 So, anyway, there were ample opportunities to note that spiders indeed have eight LEGs, like the fill in this puzzle. The four longest answers and the four 7s in the corners each have a LEG hidden within. 13A. [Pretty intense way to refer to an undocumented worker, when you think about it] is ILLEGAL. 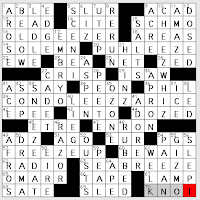 I remember several years ago when Ben's puzzle was new to the Village Voice (which later unceremoniously nixed the crossword because the paper's owners were know-nothing philistines), I recommended it to a crossword acquaintance. He did one puzzle, encountered a political clue that skewed liberal, and declared that he'd never do that puzzle again. 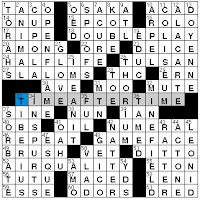 If you missed the early years of the Tausig puzzles, you can fill in the blanks with the 2007 collection, Gonzo Crosswords. 39A. [Ten-warhead ICBMs] are MXS. I don't suppose the X connotes Roman numeral 10? Nope, it's from missile experimental. 42A. [Cutesy-___] is perhaps the most innocuous way possible to clue POO. 70A. COLLEGE is a [Time for experimentation, often]. Yes! Because of the science labs. Right? 2D. PLAT, short for platinum, is [Beter than gold, in hip-hop slang]. 10D. EEK! ["A cockroach!"] Have you seen this video? 46D. [Big ___ ("South Park" character)] is Big GAY AL. He runs the Big Gay Animal Sanctuary.